Serving the entire area of Monterey, California including Carmel Valley, Pacific Grove, Del Monte Forest, Del Rey Oaks, Spreckels, Seaside, Marina, Elkhorn, San Juan Bautista, Boronda, Aromas, Prunedale, Moss Landing, Castroville, Sand City, Las Lomas, and the surrounding greater Monterey community. Free Consultation & Design Estimates in and around Monterey, CA call Toll Free 805-222-4188. 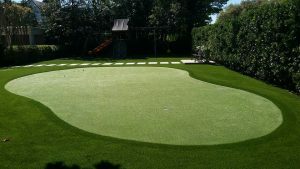 Celebrity Greens Monterey, California is the Authorized Dealer, Designer and Installer of Synthetic Grass, and Artificial Putting Greens for the entire California Monterey community. Celebrity Greens Monterey offers complete landscaping services, and we are proud to offer products that require very low-maintenance while remaining lush and green through every season and all weather conditions.